I first met Jim Cory of Horizon Mapping in Madison, Wisconsin around 2000 via an on-line discussion hosted by the Global Bank. He mentioned that he was doing some work with mapping so I sent him an introduction and asked if he could help me. Jim has been building maps for me for 10 years and helped create the first map gallery and interactive maps. This map story is one that Jim did for me several years ago. It's part of a "Rest of the News" strategy which I've been promoting since 1994 as an effort to turn "bad news" media stories into advertising that draws volunteers and resource providers into neighborhoods where tutor/mentor programs are needed. 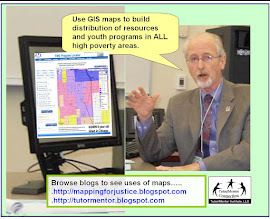 Without having help from GIS volunteers like Jim I could not be making these maps. I recently asked what he knew about creating Google maps. After a bit of research Jim created this page, which is a tutorial that anyone can use. I've already added a map to the Tutor/Mentor Connection forum, which will add to the network analysis work my interns have been doing. These maps will show where people in the forum come from and will hopefully help those located in the same parts of the world connect and share ideas and resources with each other. Thanks Jim. I'll be sure to integrate these ideas into future mapping and network building that I do.